Sheffield University archaeologists believe enigmatic prehistoric monument was used for ritual banquets on special occasions. 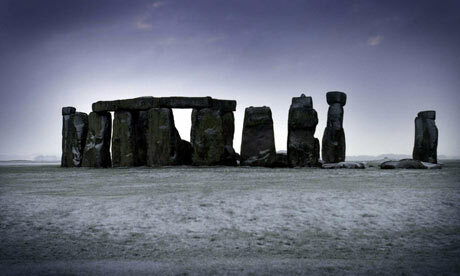 Some 4,500 years ago, as the solstice sun rose on Stonehenge, it is very likely that a midwinter feast would already have been roasting on the cooking fires. Experts believe that huge midwinter feasts were held in that period at the site and a startling picture is now emerging of just how far cattle were moved for the banquet. Recent analysis of the cattle and pig bones from the era found in the area suggests the cattle used were walked hundreds of miles to be slaughtered for the solstice celebrations – from the west country or west Wales. Professor Mike Parker Pearson of the University of Sheffield and his team have just won a grant of £800,000 from the Arts and Humanities Research Council, to answer some of the riddles about the enigmatic prehistoric monument. The grant is to fund Feeding Stonehenge, his follow-up research on the wealth of material, including animal bones, pottery and plant remains, which they found in recent excavations at Durrington Walls, a few miles from the stone circle – a site which Parker Pearson believes key to understanding why Stonehenge was built and how it was used. His team fully excavated some huts but located the foundations of scores more, the largest neolothic settlement in Britain. To his joy it was a prehistoric tip, “the filthiest site known in Britain”, as he dubbed it. “I’ve always thought when we admire monuments like Stonehenge, not enough attention has been given to who made the sandwiches and the cups of tea for the builders,” said Parker Pearson. Stonehenge was begun almost 5,000 years ago with a ditch and earth bank, and developed over 1,000 years, with the circle of bluestones brought from the Preseli hills in west Wales, and the double decker bus sized sarsen stones. It was too early for the Phoenicians, the Romans or the largely mythical Celtic druids. The Anglo Saxons believed Stonehenge was the work of a race of lost giants, and a 12th-century historian explained that Merlin flew the huge stones from Ireland. It has been explained as a place of druidic sacrifice, a stone computer, a place of witchcraft and magic, a tomb, a temple or a solar calendar. It is aligned on both the summer and winter solstice, crucial dates which told prehistoric farmers that the time of harvest was coming, or the shortest day of winter past. 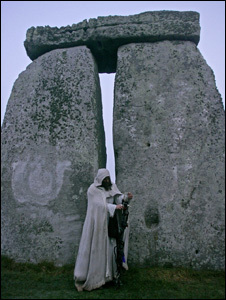 Although not all archaeologists agree – Geoff Wainwright and Tim Darvill have dubbed Stonehenge the stone age Lourdes, a place of healing by the magic bluestones – Parker Pearson believes it was a place of the dead, while Durrington Walls, with its wooden henge, was the place of its living builders, and the generations who came to feast, and carry out rituals for their dead, moving from Durrington to the nearby river and on by the great processional avenue to Stonehenge. He found no evidence that Durrington was permanently inhabited or farmed, and the first tests on the pig and cattle bones support his theory that it was a place where people gathered for short periods on special occasions. The pigs were evidently slaughtered at mid-winter, and he expects the cattle bones to back this. What the sample already tested shows is that they were slaughtered immediately after arrival, after travelling immense distances.